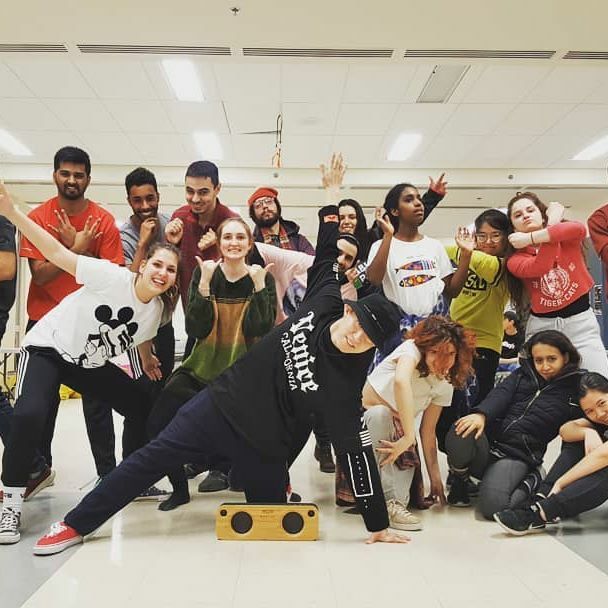 The Concordia Dance Club (CDC) is hosting their last two surprise dance workshops on April 10 and 11, concluding their first year at the university. The club welcomes everyone who likes to dance. Ranging from experienced dancers to the dancing-in-front-of-the-mirror-in-my-room training, the members have no judgements. “The whole goal is to give people, students, a space to express themselves and let go of any stress they have,” said Yasamin Fawzi, the vice president of external affairs of the club. The principle is simple, every session is a new dance style with a different teacher. The executive members are often choreographers as they are all experienced dancers. Moreover, other workshops are given by established choreographers. Most students who attend workshops are interested in, or familiar with, the featured style, but they are always welcome to try new genres of dance. A ballet dance workshop was led by Anna Krupa on March 20. Photo courtesy of the Concordia Dance Club. Since the fall semester, various styles were presented: hip hop, high heels, Latin dance, freestyle, ballet, contemporary, afro dance, funk and much more. On Sept. 20, 2018, the CDC held its first session. Prior to that, there were no dance clubs at the university. Chelsea Foster, an exchange student from Jamaica, has been attending the dance workshops since day one. “I’m still in shock that it’s the first year because everything is so well organized,” said Foster. “The people here are nice, the executive team is very friendly, inviting. It’s been so good so far,” she said. It all started when the executive team members were in CEGEP. Andrea Montes, the president of the CDC, created a dance club at John Abbott College, where the executive team met. When they started studying at Concordia, the group looked for a dance club to join,“but when we came here, there wasn’t a dance club,” said Fawzi. They decided to take the matter into their own hands and start one. The club’s success is partially due to the fact that it is free to join and accessible for Concordia students, and the club plans to keep it that way. So far, the club has been hosting recreational workshops and plans to make future events more accessible. “People in the dance community can meet people in our dance community,” said Fawzi. Weekly workshops will be held alongside these new events, but with different teachers and new dance styles. The CDC is planning an event to celebrate the end of their first year in May. “I am really proud of all the work that we’ve done and [in] future years, I know it will be even better,” said Montez. For more information, visit @concordiadanceclub on Instagram and Facebook.